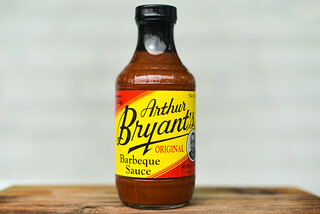 A play between mustard and ketchup gives this sauce its unique stamp that's backed up by the clean barbecue sauce flavors of sugar, vinegar, and Worcestershire. The majority of the sauces I review come from the creators themselves, which gives me a direct line to learn a bit about the history behind the sauce. Those I pick up myself tend to require some sleuthing around to discern a (hopefully) credible back story. Every once and while I get stumped though, and without a web presence, the most I could find out about Pork and Peck'r was it was developed by Toby Rogers out of Broadway, North Carolina and is mainly available at local groceries around the region. A double dose of pungency greets you on first whiff of this sauce with equally strong mustard and vinegar components. 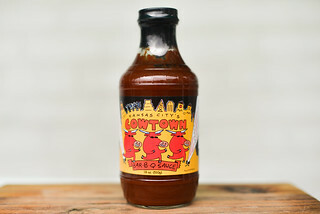 Sitting behind the dominant mustard are light tomato and Worcestershire aromas and hefty kick of pepper hinting at a spiciness beyond the mustard's bite. 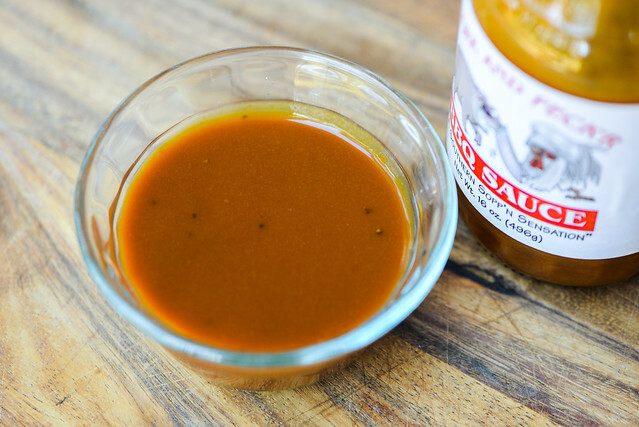 This rusty orange sauce has a smooth consistancy with a semi-glossy sheen. It's opaque, making it difficult to see any spice save for the few black pepper specs here and there. It has a medium thin thickness, which has the sauce falling in a quick and steady stream off of a suspended spoon, ending with a few quick drops and a thin coating of sauce left clinging to the silverware. While the aroma hinted at tart and spicy, the initial flavor of this sauce is sweet and fruity. There's an upfront tomato ketchup that it cut by mustard. As the sauce settles on the tongue, the mustard starts to overtake the ketchup and creates a light pungency. Next Worcestershire adds complexity right before the vinegar makes an appearance to begin the sauces tilt towards tangy. As the tartness builds, a mild heat imparts a slight burn in the back of the mouth that's tempered by the still present sugar and ketchup. This leaves the final aftertaste pretty equally split between ketchup, mustard, vinegar, and pepper. The sauce coated the chicken in a thin, even layer that baked down well over indirect heat. When moved the direct heat, there was only slight burn off and minimal caramelization. The flavor started as a sweet and tangy mustard, but the ketchup component came out after a few subsequent bites. This created an overall sweet tomato flavor with a mild mustard pungency and slight tang. The heat found out of the jar was not present after being cooked. Pulling random sauces off the grocery shelf tends to be crapshoot—I've discovered some excellent sauce this way, but also have had to endure my least favorite ones as well using this method. 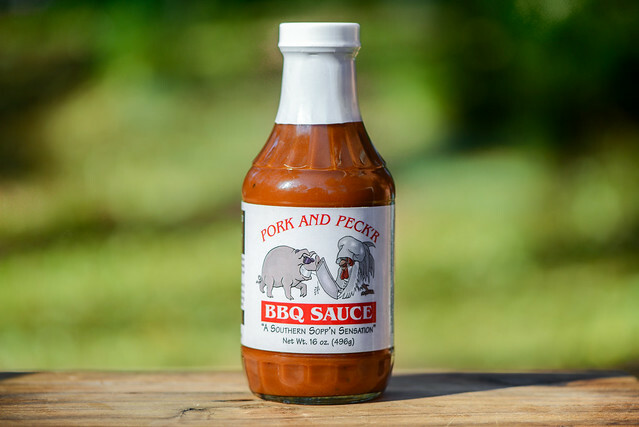 Luckily, my neighborhood Harris Teeter has a "local" sauce shelf where I've been pretty pleased with all I've tasted from that section, and Pork and Peck'r adds another tick to that list. 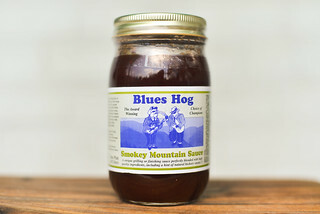 The sauce is light on the ingredients, but makes what is it in count with a pleasing blend of mustard and ketchup backed up with sugar and vinegar to create a nice barbecue sauce flavor. Out of the jar there's additional complexity by way of pepper and Worcestershire that gets a bit lost after being cooked, making me prefer the sauce more in its raw start. 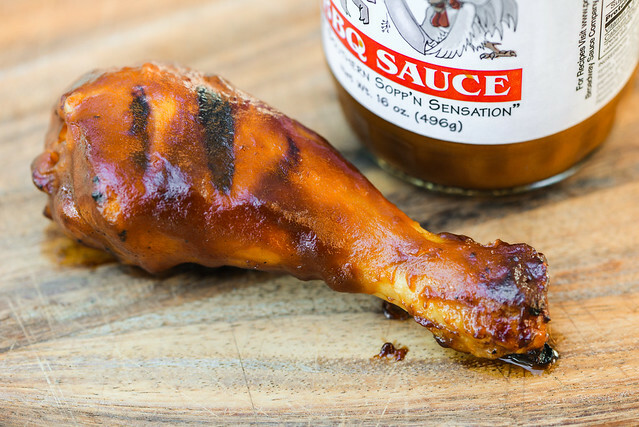 Still, the chicken leg was might tasty, and mustard is a great counterpart for poultry and pork, making this an ideal sauce to pair with either of those meats. The sauce also reminded me a bit of a few mustard based sauces I've had in Texas, which leads me to think Pork and Peck'r would also serve well as a dip alongside some smoked beef.